Former First Lady Mrs Grace Mugabe’s sister, Junior Shuvai Gumbochuma, yesterday appeared in court facing three counts of fraud after she allegedly misrepresented to the Government, her capacity to develop land into residential stands but later sold the land at a huge profit, albeit without making any developments. Gumbochuma appeared before magistrate Mr Elisha Singano and was released on cccl with the State’s consent. She was remanded to October 23. As part of her bail conditions, Gumbochuma was ordered to surrender her passport and report twice a week at Concession Police Station. 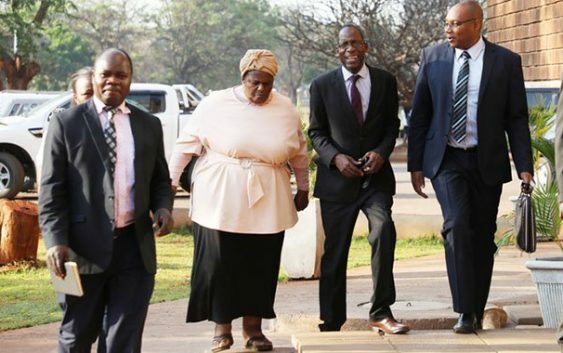 She was also ordered to continue residing at her address – Kachere farm in Bindura – and not to interfere with witnesses and evidence. It is the State’s case that sometime in August 2014, stands number 139 and 140 Gillingham Estate in Dzivarasekwa was available for sale to deserving and capable developers who could sub-divide it into high density residential stands. Gumbochuma misrepresented to the Ministry of Local Government, Public Works and National Housing that she had the capacity to develop the land. On March 27, 2015, she was offered the land and was asked to pay $424 426 to the ministry. Gumbochuma, the State alleges, who had neither the capacity to pay the intrinsic land value or to develop it then formed and registered a company called Scanlen (Pvt) Ltd as a vehicle to effect her fraudulent transaction. Between August and October 2017 Gumbochuma then sold the land to N-Frasys for $2 060 000 without paying for the land. She made a profit of $1 636 574 without doing anything. N-Frasys then paid the intrinsic land value to the ministry and paid the balance to Gumbochuma, the court heard. According to the State, the conduct of Gumbochuma was prejudicial to the good administration of the ministry as Gumbochuma profiteered from State land thereby distorting the market value of the land from a mere $424 426 to an inflated value of $2 060 000 without making any developments. As such she made an application for land under the unregistered company and the ministry acting upon the misrepresentation allocated 150 hectares of land in Good Hope to Rodonior (Pvt) Ltd.
On the third charge in August of the same year, Gumbochuma again used the same company and made an application for allocation of land in Chishawasha B Goromonzi. A few days later, the ministry acting upon the misrepresentation allocated 20 hectares of land to Gumbochuma, it is alleged. Checks made with the registrar of deeds and companies confirmed that Rodonior (Pvt) Ltd was not registered. Messrs Michael Reza and Sebastian Mutizirwa represented the State while Professor Lovemore Madhuku and Mr Shingirai Ushewokunze acted on behalf of Gumbochuma. HARARE CHOLERA 25 DEAD, 3766 TREATED SINCE 6 SEPTEMBER 2018: ECONET GIVES US£10MILLION to help in the fight against cholera. BREAKING NEWS: Grace Mugabe’s health has allegedly seriously declined and a Hong Kong Doctor has revealed according to sources that she only has a few days to live.